Sure, lyrics are important, but the voice and how it is used are what really matter in jazz singing. 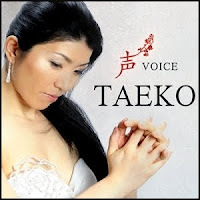 As a case in point, Japanese jazz vocalist Taeko performs two equally engaging versions of the Japanese folk song “Biwako,” one in its original language and a bonus rendition in English translation, on her latest CD, Voice. A diverse selection of American and Japanese standards, Taeko (often billed sans surname of Fukao) launches her latest release this Wednesday at the Kitano. Voice opens with a very funky version of Herbie Hancock’s “Cantaloupe Island (Get Up)” arranged by drummer and longtime musical collaborator Doug Richardson to showcase Taeko’s vocal range. Indeed she has a strong, full voice and crystal clear articulation. For an immediate change of pace, it is followed by Thelonious Monk and Coleman Hawkins’s “I Mean You (You Know Who).” Obviously not one to back down from a challenge, Taeko easily navigates Jon Hendricks’s idiosyncratic lyrics, adding some satisfying scatting of her own. However, the highlights of Voice come from Taeko’s native Japan. Even without an understanding of the lyrics (which actually address life in a Chinese village), her performance of “Soochow Serenade” is striking for its elegance and sensitivity. The way she caresses the lyrics of the Japanese hit from the 1940’s is a true pleasure to listen to. There is a similar lyrical romanticism in the one original of the set, Taeko’s brief but evocative “Spring Nocturne.” Her translation of the Japanese folk song “Biwako,” which concludes the CD, is also smooth and seamless. Both versions are pleasingly catchy, bringing out the rich tone of her voice. Though both have a nostalgic feel, the English adaptation is much funkier, with the Greg Lewis’s organ replacing Lou Rainone’s acoustic piano, whereas Richardson’s concise melodica solo adds wistful texture to the earlier Japanese take. For this outing, Taeko shows a preference for contemporary standards over Great American Songbook repertoire, but she dramatically interprets Ellington’s “I Didn’t Know about You” with the effectively spare accompaniment of guitarist Kevin McNeal. Despite her evident affinity for 1960’s and 1970’s sou l music and soul jazz, Sly Stones’s “Stand!” does not prove to be a particularly amenable vehicle. By contrast, Stanley Turrentine’s “Sugar” is totally in her power zone—a sultry and soulful standout track. Tackling diverse material with disarming style, Taeko displays all kinds of vocal chops on Voice. It is a winning session, with a set list that should appeal to a wide range of listeners. Recommended in live performance as well, she celebrates the release of Voice this Wednesday (6/16) at the Kitano.